Caltrans began construction in mid-2012 to widen the freeway for the construction of specially designated truck lanes along both directions of the Golden State Freeway (I-5) between the Antelope Valley Freeway (SR-14) and Pico Canyon Road in Santa Clarita. 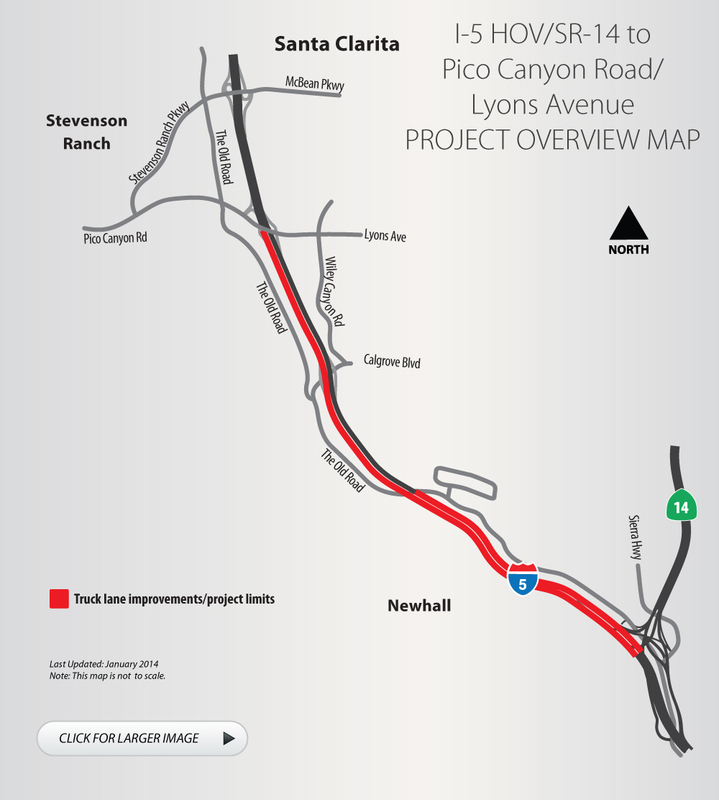 The southbound truck lane will extend from Pico Canyon Road/Lyons Avenue to SR-14 (3.7 miles), while the northbound lane will run from SR-14 to Gavin Canyon (1.4 miles). Three median retaining walls and two short sections of outside retaining walls will be built to accommodate this widening. This project will improve traffic flow, relieve congestion and enhance safety. The cost is $72 million and construction is expected to be completed in 2014. Caltrans has a multi-faceted public outreach program in place to inform the community of the construction effort. Notices of community meetings and updated construction advisories will be posted on this website periodically. Thank you for your patience. For more information, please call toll-free (855) 454-6335.